June 26, 2003 – Russian coach Guennady Chipouline named a virtual full-strength line up on Thursday for his team’s top of the table clash with Poland in Moscow during the final weekend of the $15 million World League Intercontinental Rounds this weekend. With the defending World League champions having already confirmed their spot in the World League Finals with a superb record of nine wins and only one loss in Pool A, stars like Pavel Abramov, who is the tournaments leading spiker with a 40 percent success rate, were expected to be rested for this weekend's matches before returning for the World League Finals, which will be held in Madrid, Spain from July 8-13. More Story by Vladimir Pesnya of the Russian Volleyball Federation. Story by Sergio Aguilera, Spanish Volleyball Federation. 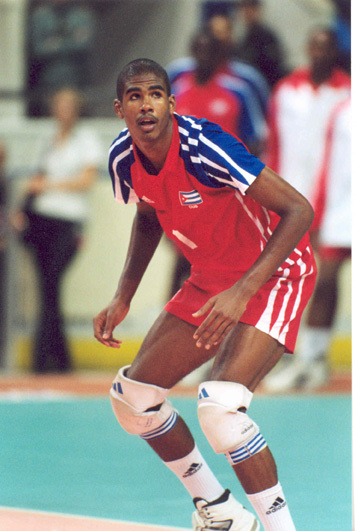 April 25, 2003 - Miguel Cambero will replace Cuban head coach David Suárez in the national team of Venezuela during the World League. more. Pic: The two captains Nalbert from Brazil (left) and Italy's Giani embrace after Italy won the second of two matches last weekend. Pic: Brazil and the Netherlands also clashed in the 2002 World Championship where Brazil won 3-0. Crunch time for the "Boys from Brazil"
Pic: Portugal star Joao Jose contemplates the big task of beating Brazil away from home. Portugal are making their fourth World League appearance at the 14th edition and this promising young team faces a tough challenge in the Intercontinental Round against reigning Word Champion Brazil, eight times World League winner Italy and Germany, the host country for the 2002 European Championship finals. 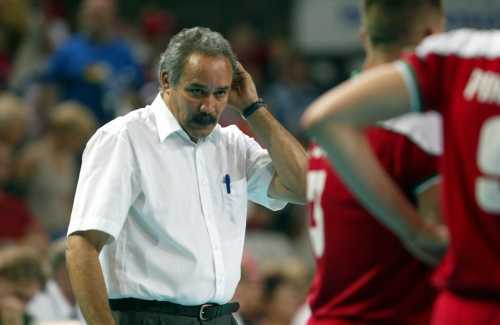 The challenge represents concentrated work for national coach, Cuban national Juan Diaz who was nominated by the FIVB as one of the ten best coaches of the 20th century. Diaz however has already worked intensively with this young team and his clear leadership has already reaped results with Portugal finishing a creditable eighth at the 2002 World Championship in Argentina. "We are in a strong group, but we can only improve if we play high level and with the best teams," Diaz said philosophically. Hi goal for this year is "to improve on last year's performance and to try to win one game against Brazil or Italy", especially at home, where Portugal will play it's matches in the magnificent hall of Matosinhos, in the charming city of Porto. more Reporting by Barbedo Magalhães, Portugal. Pic: Portugal scores against Brazil at the 2002 World League. 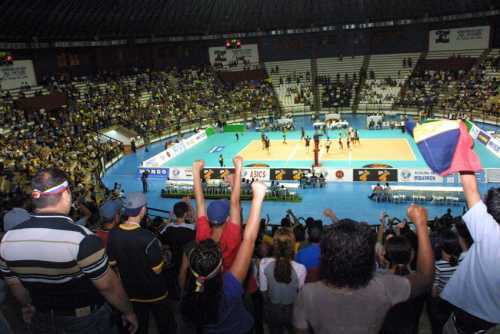 Story by Thilo von Hagen, Germany Volleyball Federation. The German team has two training camps with Russia and the Netherlands. Germany's national trainer Stelian Moculescu has a solid year planned for his team with the World League and the European Championship at home his declared highpoints. more Story by Thilo von Hagen, Germany Volleyball Federation. When Yugoslavia made their appearance at the qualifications for the European Championships in 1995, no one expected that the team, emerging from years of sanctions that stopped them from competing at international level, would take home the bronze medal. Since then they have solidified their position as one of the world's best teams and their clear aim for their sixth appearance at the World League is to take the title. The depth of the side is best remembered by recalling that their determination, legendary fighting spirit and skill gave them the biggest prize of all - the gold medal at the Sydney 2000 Olympics, a feat they repeated one year later when they took the European title in Ostrava, Czech Republic. Yugoslavia took the bronze medal at last year's World League, their best performance in five appearances, and finished fourth at the World Championship when France denied them a podium place. more Story by Novica Saric of the Serbia and Montenegro Volleyball Federation. Pic: Yugoslavia Vs Italy at the 2002 World League. 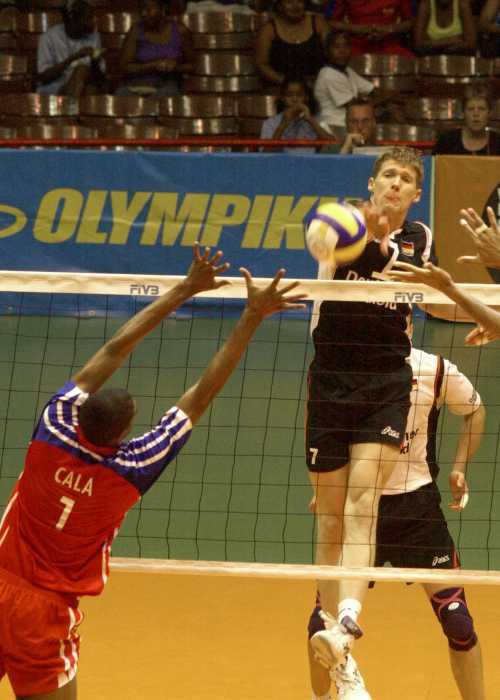 National coach Bert Goodkoop has called veteran Marko Klok back into the Dutch national squad to contest the 2003 World League to resolve his problems with the ever-important libero role. The now 35-year-old Klok exited the side in early 2000 after a dispute with the then coach Toon Gerbrands. 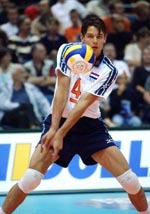 Klok was the first Dutch player to fill the libero role in the national side after the rule was introduced in the late 1990's. 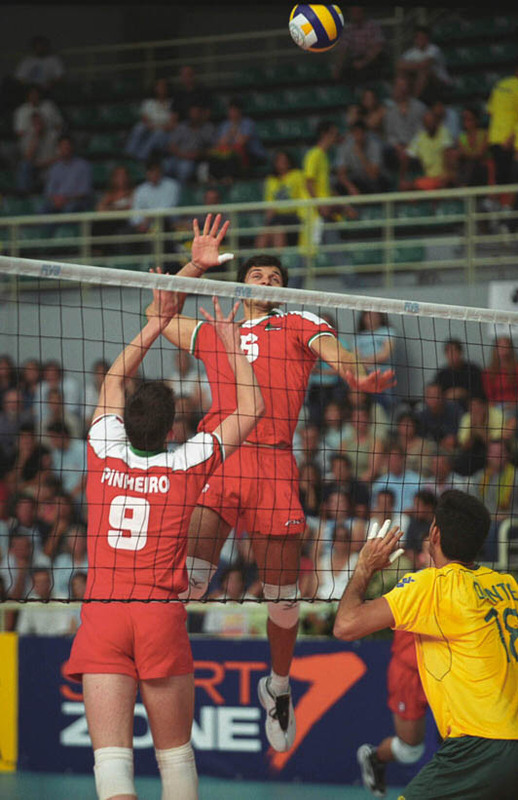 Since then, the libero position has become increasingly important in the configuration of the world's top teams. Klok comes in to replace Jochem de Gruyter who went to the 2002 World Championship in Argentina as part of the Dutch team. 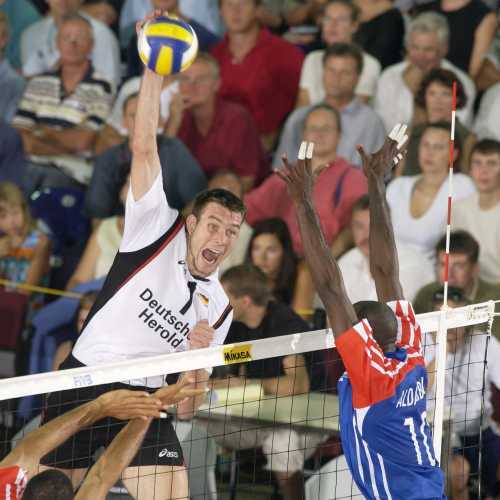 De Gruyter has retired as national team player and will try his luck in the FIVB Beach Volleyball World Tour in 2003. A veteran of some 203 national appearances and a member of the Dutch silver medallist team from the 1992 Barcelona Olympics, Klok's return will add stability to the Dutch lineup. He played for a number of years in the Italian league but is now back home at Ortec/Nesselande in Rotterdam. more Story by Arjen Meijer, Amsterdam, Pic: Dutch Captain Reinder Nummerdor in action. Pic: Chen Zhonghe has his team on track for the Olympics. China Volleyball Association has gone with a core group of 10 players who took part in the 2002 World Championship, but have propped up the young side by adding two very experienced veterans for the 2003 World League. The squad are also being groomed for the other two majors this season, the World Cup (November, Japan) and the Asian Men's Senior Championship. Head Coach Di Anhe has stuck to his policy of grooming young players. The 18-man squad includes core players wing spiker Shen Qiong and opposite Tang Miao. Eleven of his players are under 23 with wing spikers Hu Song, Wang Zhiteng and Fang Yingchao being just 20. But it is expected that Di will largely stick to his regulars in the World League, combining experience with youth to try to find the magic mix. Di Anhe has modest aims for this year's World League, saying his side is not yet strong and mature enough to achieve excellent results. more Story by Wang Yonsun, the Asian Confederation Press Officer. Pic: Lu Fei from China Vs Matej Cernic from Italy at the 2002 World League. 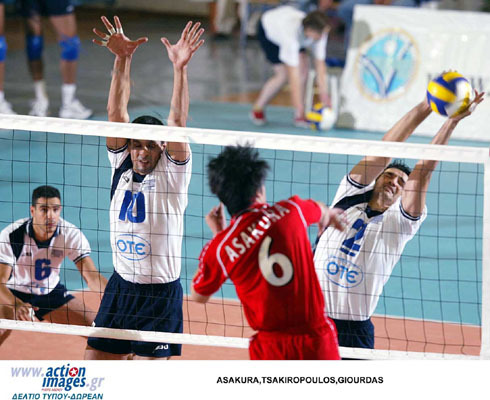 Perhaps also with one eye on the 2008 Olympic Games in Beijing, the Chinese Volleyball Association (CVA) has announced that their newly formed men's national team will go all out for a berth in the 2004 Athens Olympic Games, as well as a good result at the Asian Championships. more (From Wang Yongsun, Confederation Press Officer, Asia). Pic: France had tremendous success last year with a bronze medal at the 2002 World Championship. April 4, 2002 - Japan’s 26-year-old wing-spiker Yoishi Kato is spending his first season with the Italian League and is under contract with Sisley Treviso. Kato talks to FIVB’s correspondent Giada Imperato about his impressions of playing abroad and his new life in Italy. GI: What do you think of the Italian Championship? Kato: In Italy Volleyball is considered a professional sport and players are asked to play volleyball as their work, while in Japan players have other jobs and volleyball is not at this level, it’s an amateur sport. As for the players “duties”, like playing a precise position like setter, middle-blocker etc., in Japan I was asked to be universal, while in Italy everyone has a precise role and for me it’s easier to focus on my precise duties. Finally, in the Italian Championship, the power of the serve and of the spike are very important. The game is much more “physical” and the ball is always very fast. My impression is that the Italian Championship is the best one all over the world. GI: How is your relationship with the people in the Sisley Treviso Team? Kato: Everybody is very kind to me and this is very important for me, because it’s the right way to inspire me during training and in my technical improvement. Everyone, the other players and the staff and everyone outside the hall are really very kind and friendly. GI: How is your relationship from the technical point of view? Kato: I’m in a team with a lot of champions and this is very important because the training sessions and the matches are always at a high level. The public is very competent and passionate and this creates a wonderful atmosphere. The Treviso sports facilities (see editor’s note below) is really great, one of the best in the world, and this is ideal for professional sportsmen. GI: Are you satisfied with your Italian experience? Kato: I’m very satisfied to have the chance to train everyday with players of this high level. I hope to improve so much that I will be able to give much more of my support during the Championship Matches. This first year with SisleyTreviso is a very important professional experience and it has been better that the preceding years in Japan. Wing-spiker Yoicho Kato, 196cm tall and 26 years old, made his club debut in 1991 with the Japanese club Uenogaoka Jnr. High School. He appeared for the first time in an international match in a series of friendlies with the Czech Republic in 1997. 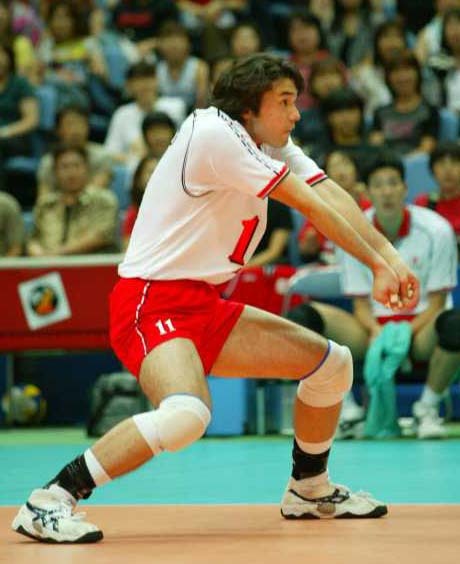 He then went on to represent his country at the 1998 World Championship, the 1999 World Cup, the 2001 World Grand Champions Cup and has played for Japan in the 2001 and 2002 World League editions. Kato is a self confessed follower of Japanese pop music and food, likes Sydney Sheldon books and also likes to play tennis. 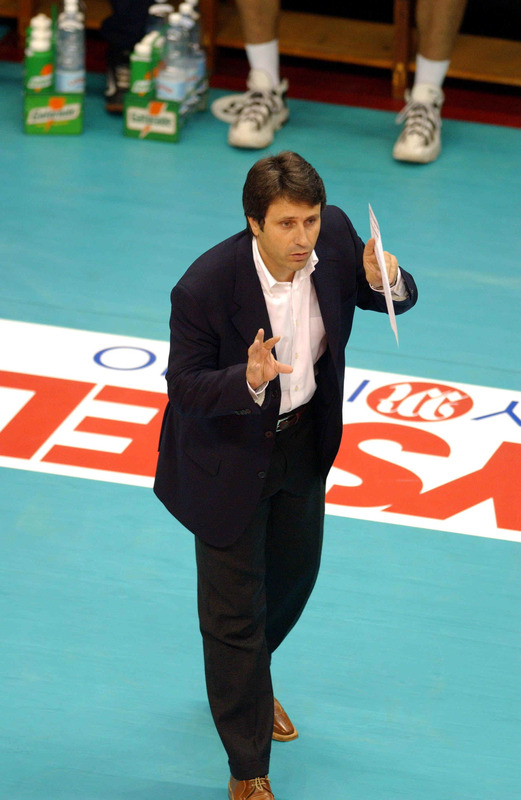 Editor’s Note: When Kato praises the Treviso Sports facilities, he speaks of the state of the art "La Ghirada" , which includes a training hall, the Palasport auditorium and even some lodgings for young players. The head coach of the Japan men's national team, Mikiyasu Tanaka, has selected a group of strong-serving players to prepare for the 2003 World League, confident that this will equip the team for a good performance in the Intercontinental Round. Tanaka, himself a legendary former player for the national side, has therefore called up big guns like Takahiro Yamamoto, who is also the best spiker of the team, blockers Nobuhiro Ito and Kota Yamamuro and setter Daisuke Usami who has also more than proved himself attacking from the serving position. Japan, a former Volleyball powerhouse, did not perform well in the 2002 World League, scoring a solitary win and 11 defeats in the Intercontinental Round. They fortune changed however at the 2002 World Championship two months later in Argentina, when they bounced back to finish a creditable ninth. Yamamoto proved to be deadly in attack and his many spiking points helped propel the Japanese side through the tournament.